Nothing much ever happens in the sleepy Texas town of Antler. Or so Toby Wilson thinks until the summer of 1971 blows into town like an ill wind, bringing challenges and change aplenty. His best friend Cal’s brother is in Vietnam fighting, and Cal can’t seem to bring himself to even write him back. Toby’s mom went to Nashville for a country music competition, and now Toby isn’t sure she’s ever coming home. And then Zachary Beaver rolls into town in a trailer with red letters proclaiming him the fattest boy in the world. That sure brings some excitement to the town as folks line up to pay their two dollars and gawk (Toby and Cal included). But then Zachary’s guardian leaves town . . . without Zachary, and as they begin to spend more time with him, Toby gradually discovers there’s more to Zachary than a stuck-up, overly hygienic, overweight kid. Why does this book not get more love?! I’d never even heard of When Zachary Beaver Came to Town until I happened to stumble across it in the middle of a book sale, where I picked it up on whim. It’s fabulous. The tone is simple and captures small-town thirteen-year-old boy remarkably well. There are a lot of coming-of-age elements as Toby and his friends deal with loss, loneliness, love, family, and learning to understand those who are different from themselves. And all of this is expressed in a simple yet moving way that I really enjoyed reading. I valued the flaws that were present even in the most likable of the characters, the humanity of them, and the way these flaws influenced their choices. It was also interesting to read something Vietnam War era that wasn’t focused on big cities, university campuses, and peace protests; you get a much better picture here of how the war affected everyday life for the majority of the country, I think, and just a better picture of what life was like at that time. 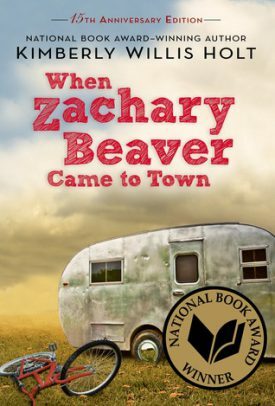 I would certainly recommend When Zachary Beaver Came to Town both for middle-grade readers (the intended audience) and for older readers as well. It’s excellent. The year is 1242, and one dark evening a disconnected group of travelers find themselves together in a small French countryside inn, trading stories to pass the time. Surprisingly, the one evening it seems that all their stories are part of a larger story, a story of three children with seemingly miraculous powers and their faithful dog who is revered as a saint by local peasants. And the tale doesn’t end with the miracles these children have performed, for the very king of France has now declared war against these children. Perhaps, through their interwoven tales, the travelers can puzzle out why such a thing would be. I was deeply impressed by Gidwitz’s work on The Inquisitor’s Tale. The story is obviously well researched, emulating a storytelling style similar to that of Chaucer’s tales (but in prose), which adds an air of authenticity. It also makes the development of the plot quite interesting, although the pace is slower than that of many tales because of the style. The story draws heavily on both historical research and on the saints tales and folklore of the day, creating a tale that is equal parts historical fiction and fantasy. It’s quite appealing. Also appealing are the characters and the manner in which they develop over the course of the book, particularly after the four of them begin traveling together. Oddly enough, the author does at times choose to use terms which wouldn’t have been common (or even known at all) in 1242–like “allergic” for instance; however, this practice does serve to keep the writing more colloquial, which fits the setting. One of the most powerful and poignant aspects of this story is the way in which it addresses the issues of ignorance and hatred of the alien that were present in that particular place and time, discussing these issues in a way that makes the reader sorely aware of the similarity there is to the discord present in our own day. A painful reminder that we could save so much heartache if we could just learn from history. I also appreciated the way in which complex and difficult theological ideas were incorporated into the story and the way in which the plot tended, ultimately, towards hope and encouraging the reader to be the change we want to see in the world. 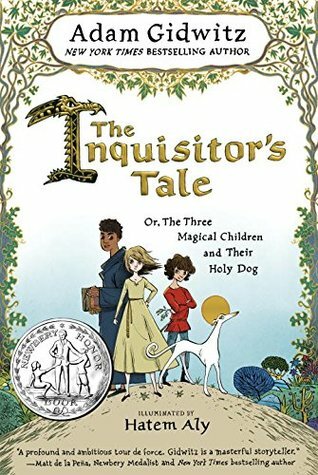 Demographically, The Inquisitor’s Tale is intended for an upper middle-grade audience, but I think it is an incredible story for anyone that age or older. What if. . . ? The year is 1777. The American colonies have lost their revolution, and many have been killed or have fled to Spanish and French territory for safety. Not that any of that concerns 15-year-old Creighton Brown. 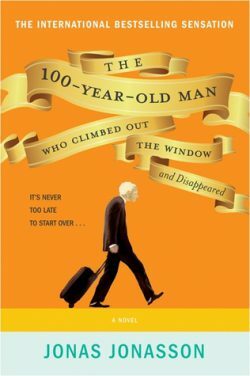 Living the high life in British society, he is much more interested in drinking and gambling away any fortune his family might once have had–and there’s little enough left since his father’s death in the war. But when Creighton is kidnapped and shipped off to the “uncivilized” colonies, his perspective is challenged . . . his perspective on just about everything. I have admired Gary Blackwood’s writing ever since I discovered his middle-grade historical fiction story, The Shakespeare Stealer–which is amazing, just saying. I didn’t love The Year of the Hangman in quite the same way that I did Blackwood’s Shakespeare books, but I did find it quite enjoyable. The whole alternate history, “what if” idea was very interesting, and I think he handled it well, blending both real history and logical possibility in a manner that was very credible. On the whole, the plot and developments were, however, a bit predictable–still enjoyable, but not particularly gripping or surprising. 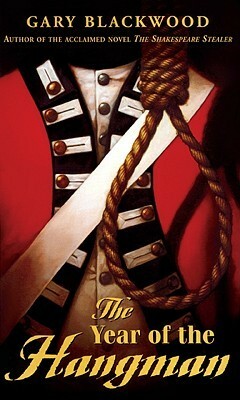 Still, I think The Year of the Hangman was definitely an interesting read, particularly for those interested in Revolutionary War history or in alternate history stories. The year is 1914, and Blossom and Alexander are in their freshman year of high school. Things are beginning to change–like the popular girls’ crushing on Alexander, his newfound obsession with getting into the elite high-school fraternity, or the new suffragette history teacher who’s bent on educating the freshmen about ancient Egypt. Some things never change though–like Blossom’s spunkiness, Alexander’s complete disavowal of his ability to interact with spirits, and Blossom’s mother’s sticky fingers. So when an ancient Egyptian relic turns up in Blossom’s mother’s pocket, naturally Blossom gets interested. And when the ghost (ka, whatever) of an ancient Egyptian princess demands Blossom’s help, well, of course she’s got to get Alexander involved, though she’ll have a time and a half dragging him away from the miseries of his fraternity initiation. Well, while she’s at it, she might as well make the initiation a bit more interesting, too. . . .
Richard Peck’s books are superb, and I think the ones set in Illinois and thereabouts around the turn of the century are some of the best. He has such a feel for the atmosphere of the time, making it alive rather than stuffy and historical. Plus, these are some of the most absurdly funny books I’ve ever read. Blossom Culp and the Sleep of Death is all of that and more. Blossom has got to be one of the most amusing and lovable characters ever–while being someone who’d probably drive me nuts if I actually met her. Scruffy, saucy, and smart as can be–that’s Blossom. In this particular story, seeing her and Alexander growing up from children into young adults is really interesting and funny and kind of cute as well. The inclusion of spirits and historical (for Blossom as well as for the reader) mystery is classic for this series, but bringing in an Egyptian princess is something else. It works though, oddly enough. There’s enough historical detail to make it credible without feeling forced. And the combination of eerie mystery and absurd humor is perfect. 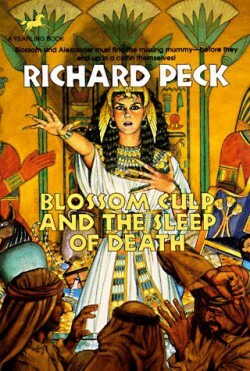 For any readers upper elementary and older who enjoy a humorous historical story, Blossom Culp and the Sleep of Death is definitely recommended whether you’ve read the other books in the series or not. In 2009, Tara Fraser runs through the town of French Hill in Nova Scotia, passing the burned out remains of her old family home–the place she’d lived most of her life. Little could she imagine the deep ties she unwittingly retains with her ancestress Josey Fraser, a girl who grew up on the very same homestead back in the 1850’s. But when Tara finds an unusual quicksilver-containing family heirloom in her mother’s old jewelry box, the ties that connect these two girls begin to reveal themselves, uncovering a history of unexpected fortune and tragedy both. My experience reading Mercury was really kind of mixed. I really love what the author tried to do here, melding the stories of these two girls. And I think overall the way the story revealed both of their stories side-by-side was very effective. But I found the extreme similarities between them rather forced at times; their own appearances were too similar, as were the relations between them and their best friends (who were also remarkably similar). I guess this is something that works better for the middle-grade audience this seems to be intended for, but it was counterproductive for me as a reader. On the other hand, I did like the characters and their stories. And I loved the setting, both in historic and present-day Nova Scotia–it’s pretty rare to find graphic novels set in Canada, so that’s always fun. The art was nice too, definitely a western (non-manga) style, but in a modern graphic-novel sense, not in an annoying comic-book sense. The other thing I found notable about this story was the touch of magical realism thrown in towards the end of the book. From reviews I’ve seen, this is pretty typical of Hope Larson’s writing, but I definitely wasn’t expecting it, so it really threw me. 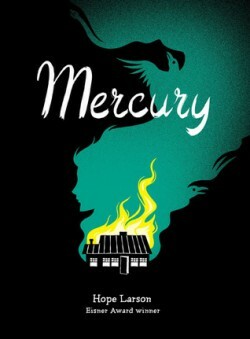 On the whole though, Mercury was a nice graphic novel, most recommended for a middle-grade or high-school audience, but with enough depth to be appreciable by adult readers as well. On the outskirts of a small town just off the shores of Cape Cod sits a small house known to the locals as Blackbird House. Lovingly built by a fisherman–for his wife to live in while he went to sea–in the early days before our country was an actual country, the house has seen numerous inhabitants over the years. Each family has had its own story, and each story has left its own unique mark on the land and the house, connecting the lives lived there across the ages, memory upon memory. Blackbird House is a welcome, although unexpected, collection of tales centering on a small cabin near the shore. I guess I ought to expect this sort of work from Alice Hoffman, but she still has the gift to surprise me–which is actually really nice. Every tale in this collection was enjoyable in its own right, and seeing the connections between them made them even more interesting. Not that there are particular thematic connections or anything that direct; there are all sorts of stories and characters here, everything from sweet, unexpected romances to heartbreaking tragedies to tales of ungrateful modern youth. No, the connections are more subtle than that, motifs that carry throughout: the sweet peas and the pond behind the house, the white blackbird that haunts the house, red shoes (a sure sign of witches! ), that sort of thing. I loved the slice of history that’s presented here, ranging chronologically from early settlement days all the way to very recent years. Yet spun throughout the history is a feel of fairy tales that gives a different weight and experience to these stories, making them timeless in a unique and beautiful way. 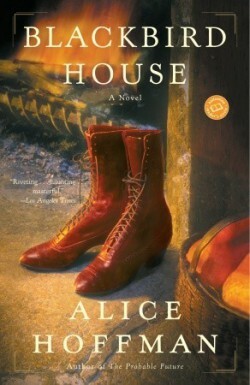 Blackbird House is definitely an adult collection, but for adult readers–whether your preference is historical fiction, short stories, or even fairy tales–I think this book has something unique and special to offer that is well worth reading.